One month from today we will be leaving for Ethiopia. Oh my stars!!!! So excited to return and have so much to do before the trip. We wanted to introduce you to one of our amazing team members Robyn, or as Kim fondly calls here “one of my favorite football mom’s.” This will be Robyn’s first trip to Ethiopia and she has been planning for over a year for this visit. Robyn is a very talented and gifted seamstress. 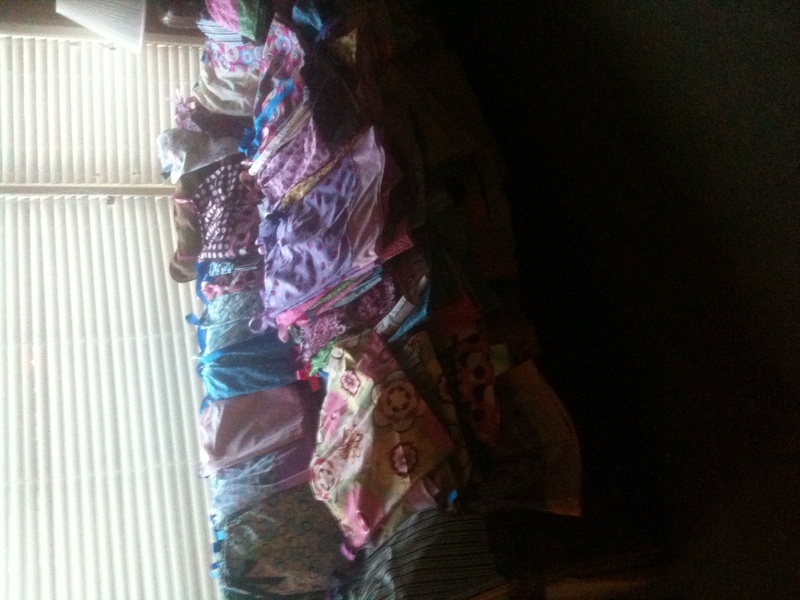 She organized and along with her wonderful friends made EACH CHILD AT LOLA a twin size quilt. Friends, these quilts are so beautiful. We can’t wait to place them on the new beds at the new Lola house. Over the past several months, along with quilt sewing she’s been making valances for the new Lola home, pillowcases and the list goes on. One project close to Robyn’s heart and one that will keep giving even after she leaves is teaching the older girls at Lola how to sew. Here at EOR we’re always trying to think of projects we can establish that will be sustainable and successful. 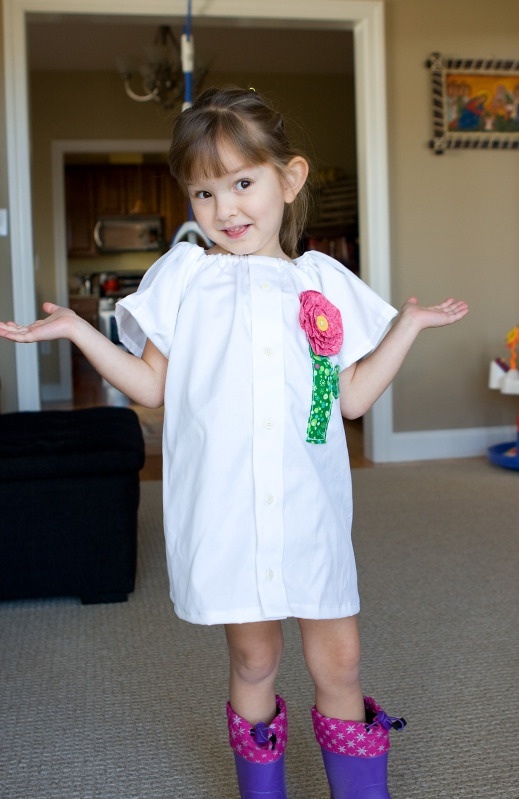 This sewing project is perfect for that. Some of the girls at Lola are older teenagers. Our goal is to teach a skill that they can use to make items that Lola can sell, along with teaching a skill that they can use after they’ve left Lola. We would love to bring a sewing machine with us but feel it’s best to purchase in Ethiopia for a few reasons. One, it’s important to purchase as many items in country as we can to help their economy, and also our voltage is different and with an American power cord would most likely not last long even with a converter. Sewing machines are quite expensive in Ethiopia. We’ve found a few options for around $500. Our hope is to purchase this is Addis Ababa and then transport down to Mekelle. We also have some sewing items on our wish list to take with us. These are items that Robyn personally selected that will help the girls with future sewing projects. Would you like to help with this project? To make a donation of any amount towards the sewing machine please visit here. To check a item off our wish list please visit here. 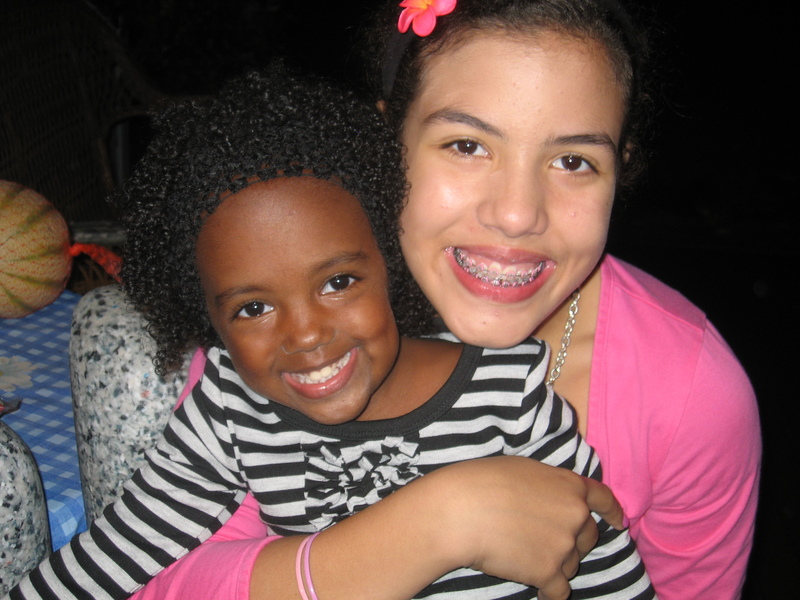 Thank you for making a difference in these amazing girls lives at Lola Children’s Home. 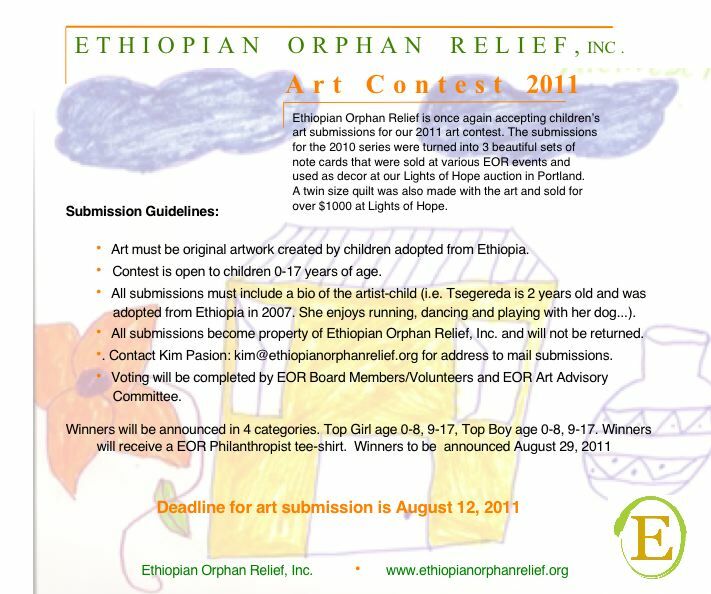 Break out your crayons and find your paint brushes — Ethiopian Orphan Relief is once again accepting art submissions for our 2011 art contest. The submissions from the 2010 series were turned into 3 beautiful sets of note cards which we sell throughout the year as well as the gorgeous quilt that sold at Lights of Hope auction. Paige our lovely VP and blog queen assigns days for board members to blog. I’m sitting here watching my children and nephew swim while watching the most beautiful sunset I’ve ever seen on our tropical vacation. I’m looking at the sky and all of a sudden gasp. Oh my stars, today I was supposed to blog. I grab my computer and think I’m happy there is a 6 hour time change so I can indeed blog on the correct day. While on this trip we’ve talked to our children often about my upcoming trip to Ethiopia. I’ll be traveling in November along with fellow EOR board members and some of our donors. The last few times I’ve traveled to Ethiopia it’s been tough on our children. I’ve only been away one or two nights in my son’s 11 years and daughter’s 4 years other then trips to Ethiopia. Something I started doing to make it a little more fun for them is leaving a small trinket, gift for each day I’m away. I wrap it and tie it with a tag …day one…day two, etc. I then put all the gifts in a bag and each morning my husband lets them open their little gift. They seem to love this and I sure have fun shopping for the trinkets. The gifts are simple…my daughter loves straws and recently discovered straws that bend so I picked up a bag at the market. Stickers, pack of gum, a shell I found on this trip, a gift card for movie rental, itunes card, etc. Some other ideas that seem to help at our house is I find a map and we put thumb tacks on all the places we will be visiting, a paper chain with rings for how many days I’ll be gone and then they tear a ring everyday and I leave little notes or jokes around the house where I know they will see them, a sock drawer, the bathroom mirror, school backpack, etc. These little gestures probably help me more then them but it’s a small way to let them know I will be home soon. 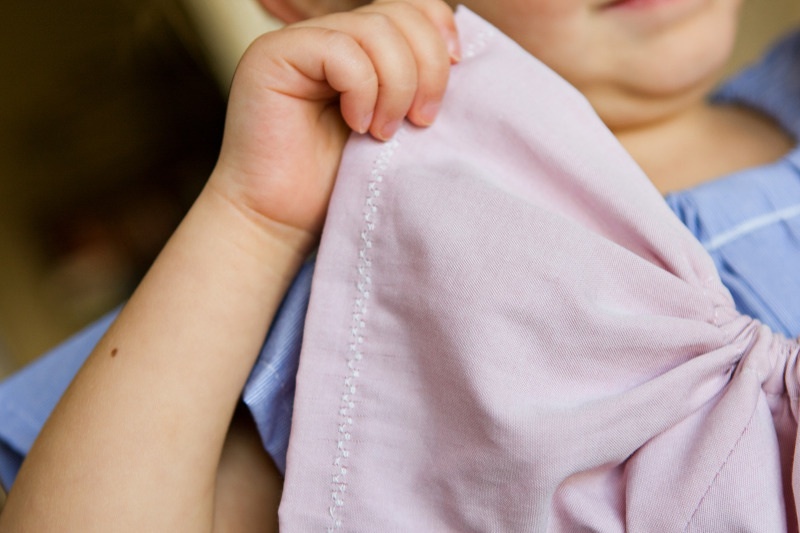 What types of things do you do for the little ones we leave at home when you travel? Would love some new ideas. Posted on January 9, 2011 by ethiopianorphanrelief under Crafts, Do Something! This summer we put out the idea if you knew how to sew we could use your help in creating dresses for the girls in Ethiopia. The dresses would then be hand delivered in December by Team Tasfa, a group traveling to Southern Ethiopia. The response we received was astounding and the dresses kept coming and coming. 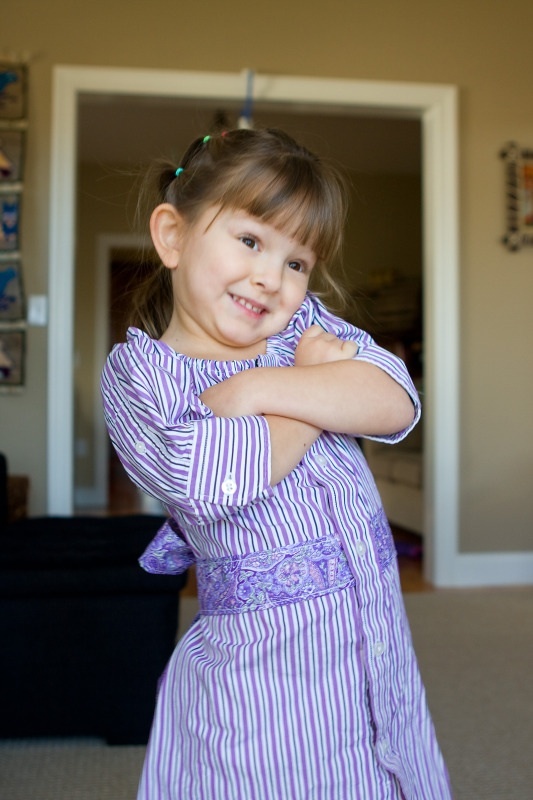 Allyson, from Portland put together a group of her friends and they created 123 dresses. Yes, you read that right 123 adorable dresses that are sure to brighten a girls life in Ethiopia. Allyson learned about EOR last year when she volunteered the night of Lights of Hope auction. Since then she has been a superstar volunteer with Project Gena backpacks and the sewing project. Allyson and her husband are anxiously awaiting a travel date to meet their baby in Ethiopia. Thank you Allyson for always being so willing to help EOR. We appreciate all you do. It is simply amazing to us how we put the plea out there to you our grand supporters for help in creating dresses for the girls in Ethiopia. We are speechless at how many of these creations have arrived at the EOR doorstep. Meet Staci and her wonderful friends, Jacy, Daija, D’s mom, Lacey & Christina. Staci has a heart for orphans in Ethiopia. She’s the proud mom to a Ethiopian tot. She and her east coast friends created the most dazzling 24 dresses. They are made out of men’s shirts. How creative is that! Seriously folks, these dresses would sell in a boutique for top dollar. I fell in love with quite a few of them. I boxed them all up and shipped them to the midwest where Team Tasfa will hand deliver each and every dress to Ethiopia. Thank you Staci and friends for your generosity and creativity. When I grow up I hope I can learn to sew like you. This afternoon I had one amazing family stop by our home to drop off 154 pillow case dresses. Yes, you read that right, 154 dresses. WOW! I first met Heidi & Rob this past May when they volunteered their time the night of EOR’s Lights of Hope auction here in Portland. They are a family with 5 kids and are anxiously awaiting a referral from Ethiopia for a few more children. 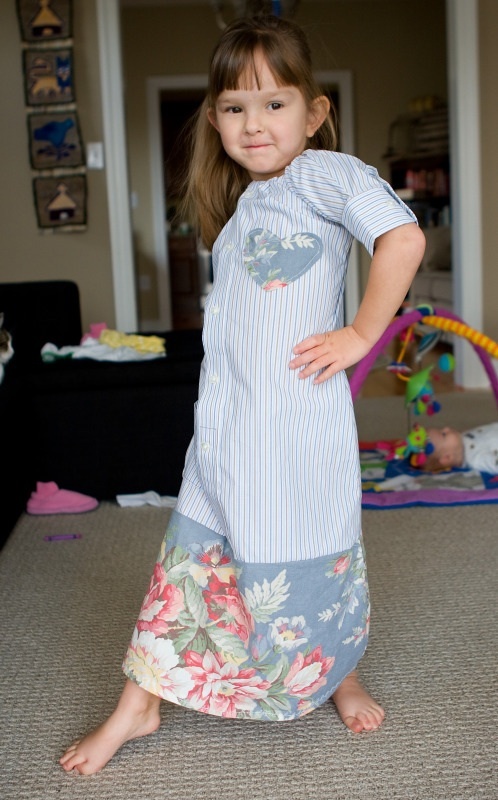 When Heidi heard about the need for pillow case dresses for children in Ethiopia, they made it a family affair and all joined in sewing the beautiful creations. Heidi shared that they wanted to get involved as their children will be from Ethiopia and wanted to give back to the country. Thank you Heidi, Rob, Brittani, Kelsey, Kassidy, Hayden & Allison for your giving spirit. These dresses are going to bring many smiles. Remember these two lovely sisters who were saving for a Wii game system and instead gave their money to EOR to help fund a playground at SOS EE. Well these two mini philanthropists gave again. 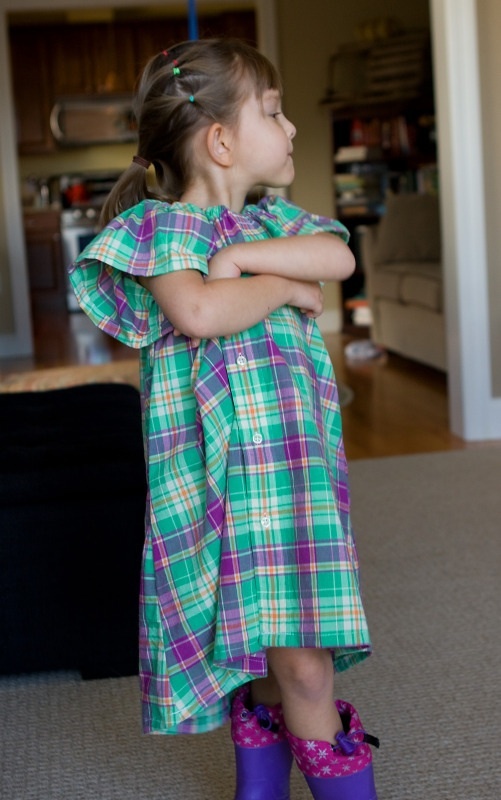 Maria & Lily created 8 adorable pillow case dresses for the girls in Ethiopia. Both girls sewed the beautiful dresses and tied them with fancy ribbon. 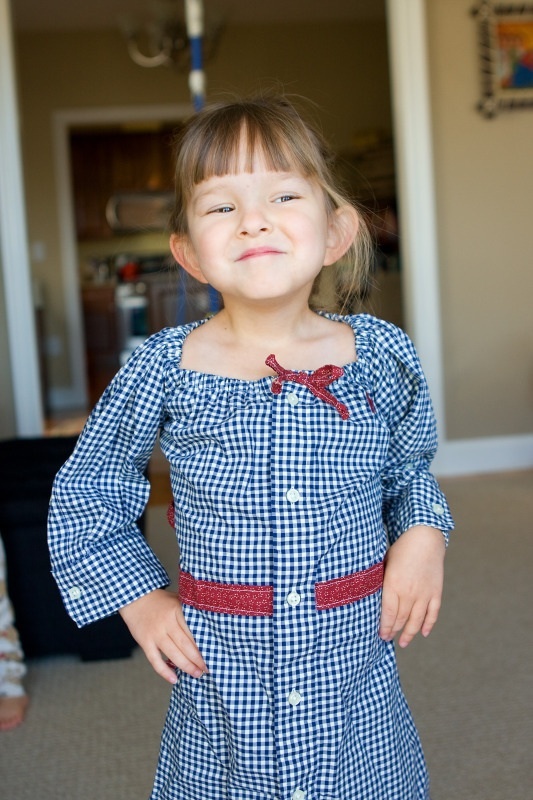 These dresses are sure to make the girls in their littlest cousin’s homeland smile. Thank you Maria and Lily for your giving spirit. 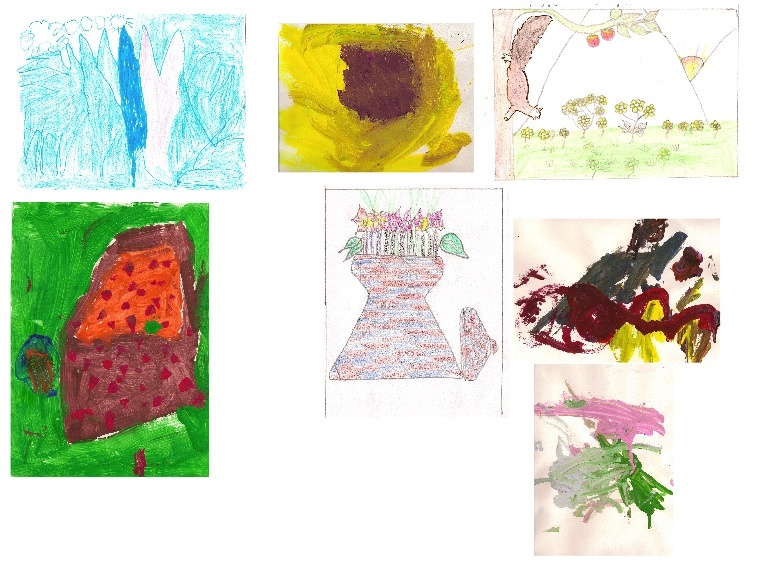 Remember late this summer when we announced the 2010 art card contest winners? Well, those little picasa’s will be ready to purchase next week. Need a gift for a teacher, babysitter, a grandparent who has everything? We have the perfect gift! 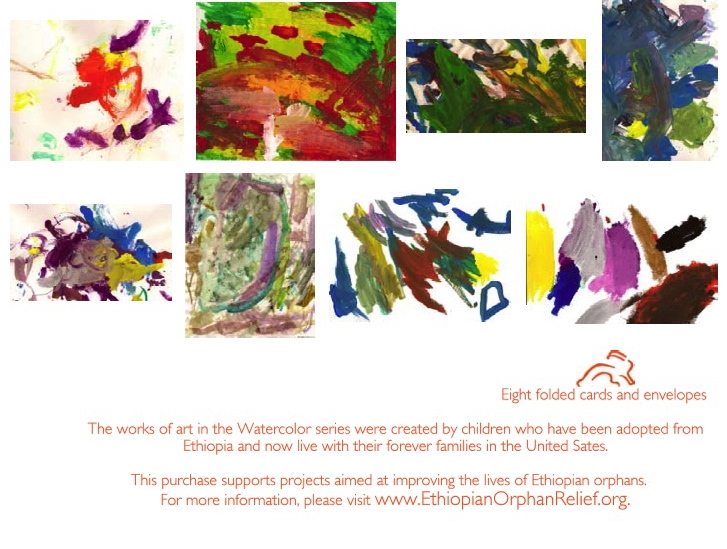 Our third series of note cards, designed by Ethiopian children, are available for purchase. Each card is a high quality folded notecard, printed on heavy card stock, with a bio of the artist on the back of the card. All the proceeds will go towards EOR projects! 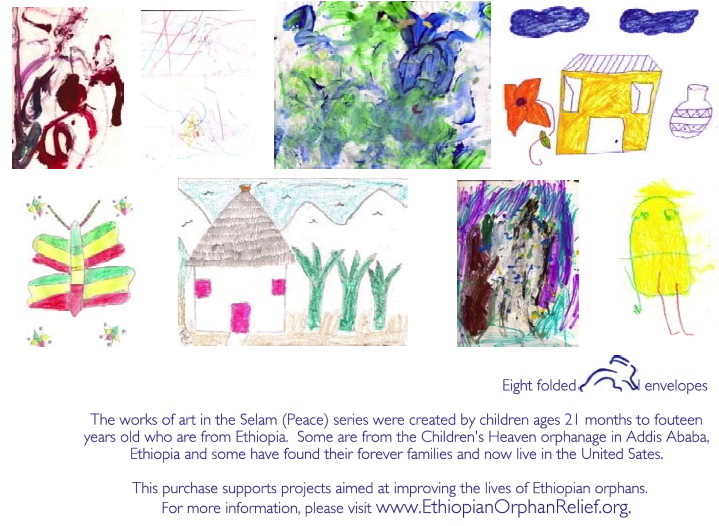 If you would like to purchase please contact kim@ethiopianorphanrelief.org and mark a few things off your shopping list. These cards would also make great holiday cards. Here are a few samples of the style of cards available. Each series has 8 cards in it for $15.00 a set. A HUGE thank you goes to Barbra at Paper Rabbit Designs, in Portland, Oregon. Barbra has been an amazing supporter of EOR since the beginning. She shares her talent and design in printing our cards. Her generosity is amazing. 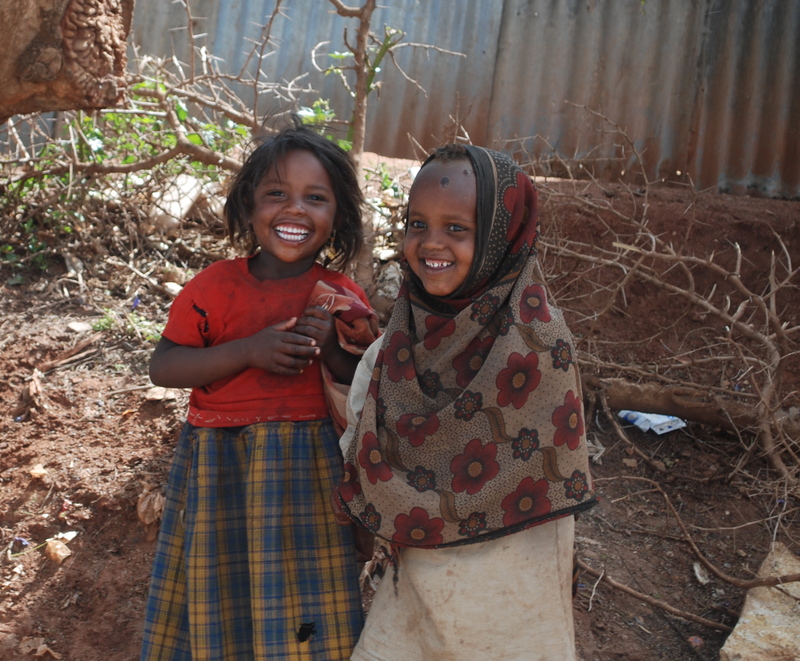 You might recall our recent blog post about the need for girls dresses in Ethiopia. 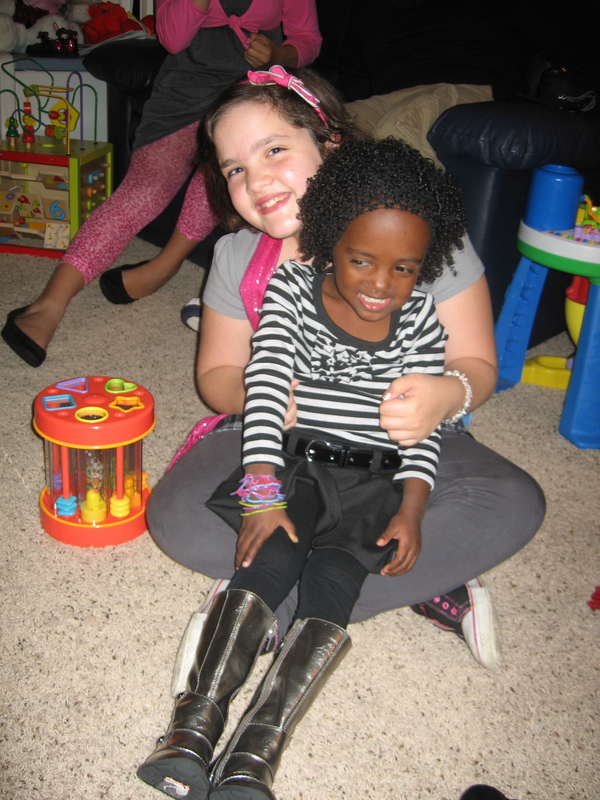 Remember Sabrina our guest blogger & EOR supporter? She is hosting a Stitch & Enrich Party in Humboldt County, California, September 25th from 5-9pm to create pillowcase style dresses for the girls in Ethiopia. Sabrina will have numerous sewing machines, pillowcases, ribbon, elastic, accessories , food and drinks. 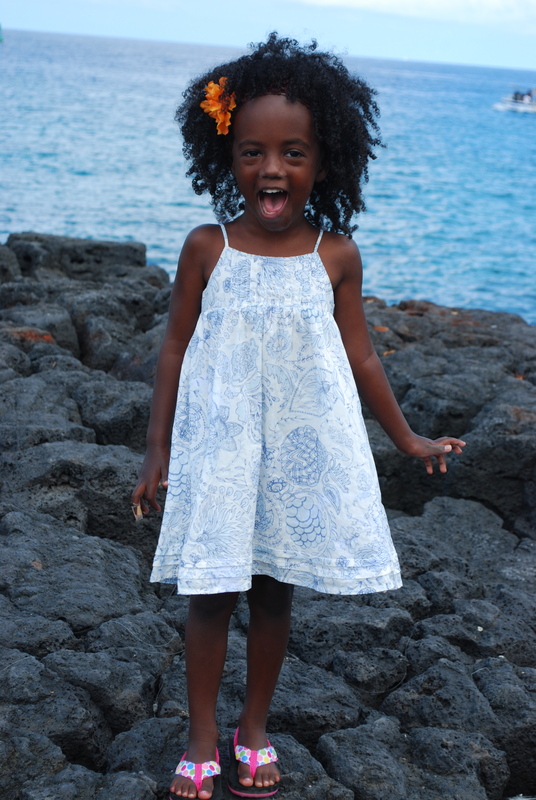 Imagine the joy a little girl in Ethiopia would feel to be able to pick out and have their very own dress. In December friends of EOR will be traveling to Ethiopia to help with the building of a orphanage at FOVC. They will be hand delivering the dresses on this trip. We also need dresses created in larger sizes up to size 14. 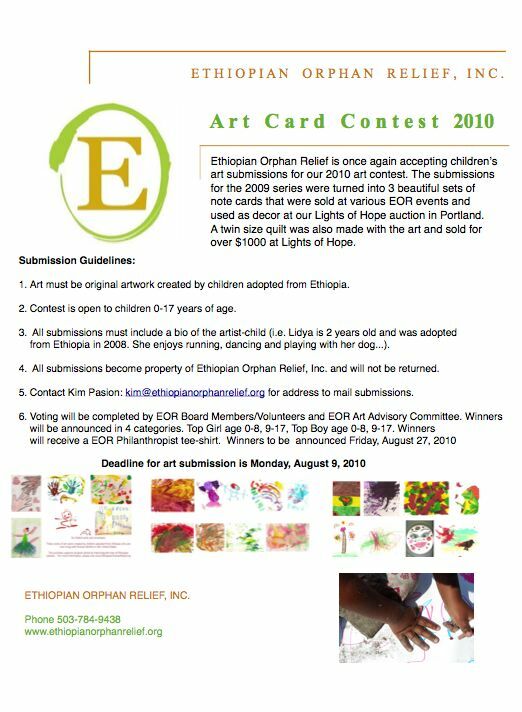 Contest is open to children 0-17 who have been adopted from Ethiopia.